For the last few years, the Rock Creek football program has became accustomed to the Mid-East League and district competition schedules. Beginning with the 2018 season, Mustang football will move from the previous 4A classification into the smaller 3A class due to the change in the Kansas State High School Activities Association classifications. The main reason for this change is to decrease the gap between the size of schools within each class. Next year’s football schedule will result in the subtraction of Silver Lake and Wabaunsee as competition. The Silver Lake game was removed due to the reduction of league games and scheduling conflicts, while the Wabaunsee game was changed because they will no longer be in the league for football. “We only have three non-district games… so it will put more emphasis on the games earlier in the season,” defensive coach Butch Hayes said. Another change is that the annual Backyard Brawl versus Wamego will not take place for at least the next two years. 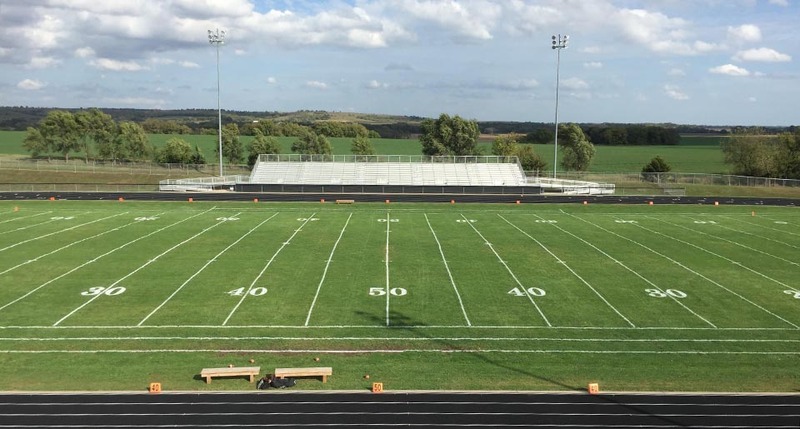 The reason for this is that the district classification line split Rock Creek to the east district and Wamego to the west district, which causes conflicting schedules between the two teams. “It doesn’t look like we will be playing them anytime in the future, so it’s disappointing,” Hayes said. The 2018 season will bring many changes to the program, but the coaches plan on preparing the football team as they have in the past. “It is still the same type of thing; you just prepare for each opponent each week and do the best you can,” Beam said. Athletes of the 2018 season will be competing in a new schedule with different teams, but have a positive outlook in next year. “We’ll be able to play some people that we’ve maybe never played before and get a new start to a new season,” freshman quarterback Charlie Killingsworth said.